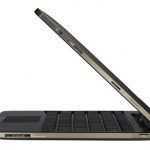 Engadget has a story about the new Transformer 2 or Eee Pad Transformer Prime as it’s now been announced. Asus CEO Jonney Shih has shown off the tablet to Walt Mossberg at the All Things Digital AsiaD show. Ben posted some info yesterday after we started to see teaser advertising. We now know that it’ll ship with a quad-core NVIDIA chip (Kal-El), 10-inch display, mini-HDMI port, a claimed 14.5-hour battery (which I assume is measured attached to the dock), and an SD card slot (although this may be on the dock too). I’m also assuming that they won’t be stepping backwards and removing features form the original Transformer so it will have to have a USB slot and a micro SD card slot as well (on the dock). 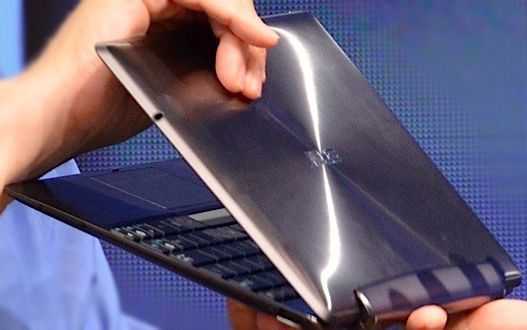 The back of the tablet looks sleek in a brushed style aluminium that looks like the lids of the new Asus Zenbook line of laptops. It’s 8.3mm thin and lighter than the current transformer which sounds very good to me. I use my Transformer (the original) all day everyday, but find that I don’t use the dock as much as I thought I would. I now have a stylus — with Evernote, the onscreen keyboard, and the stylus, I get by in 90% of cases. The Transformer itself lacks a USB port, and I do find that pretty constraining. That means I have to connect to the dock to get USB capability and that means adding weight and size. Since I’m yet to run into a scenario where I need the extra (massive!) battery life that the dock gives me, I do get annoyed at having to add the dock to the device to get a USB port. Sure, an adapter for the Transformer would solve that issue, but it costs a whopping $70 by the time it’s shipped, and I can’t pay that much for a tiny bit of plastic. What I’m really looking forward to, as I read about the Prime, is the reduction in weight with the dock, or a dream come true: the addition of a full sized USB port on the Transformer itself. I’m not going to kid myself that we’ll get a USB port, but if the unit is slimmer and lighter as expected, then I may not mind leaving the dock attached, and that would mean that the USB port on the dock would suffice. Yesterday I played with the Eee Pad Slider, and while a bit heavier than the Transformer, it’s lighter than the Transformer with dock, and I was seriously considering purchasing the slider until the announcement of the Transformer Prime. I think I’ll wait until final figures around weight and size come in before making a decision. Jonney Shih also said to Walt that he expects Ice Cream Sandwich to hit tablets by the end of the year and it’ll be interesting to see what OEM’s push it out first (if at all). Keep an eye out for Transformer Prime publicity on November 9th which is the official launch date. I sent my TF1 back because of the sucky mic and sub-par speakers. I loved everything else. It IS mostly a Consu,ER machine, and as such MUST have great aUdio and video I/o. Test this first… I. Know you will love the speed and ICS. If you only need an USB Port sometimes but don’t want to carry the dock around all the time, how about the “Asus Transformer Extention Kit Usb”. It’s a plug with USB Port which connects into the docking slot of the Tab.